What Day Of The Week Was April 13? 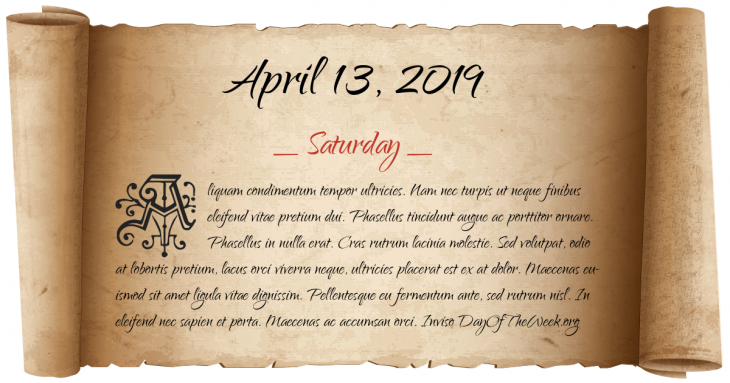 April 13, 2019 was the 103rd day of the year 2019 in the Gregorian calendar. There were 262 days remaining until the end of the year. The day of the week was Saturday. Miyamoto Musashi defeats Sasaki Kojiro at Funajima island. During the Cold War, American Van Cliburn wins the inaugural International Tchaikovsky Competition in Moscow. Vietnam War: The Battle of An Lộc begins. Portugal and the People’s Republic of China sign an agreement in which Macau would be returned to China in 1999.
Who were born on April 13?